If you think taking vitamin C can help prevent getting the stomach flu, you're mistaken. While vitamin C contains antioxidant properties that may help strengthen the immune system, the only way to prevent the stomach flu is to avoid acquiring the virus that causes it. The stomach flu is spread from human-to-human contact or through infected water or food. The most effective way to prevent developing the stomach flu is to wash your hands often, thoroughly cook your food and avoid people who appear to be sick, according to the University of Maryland Medical Center. The stomach flu, also called viral gastroenteritis, is a misleading term. The stomach flu is not related to the influenza virus, which causes the flu, according to MayoClinic.com. The stomach flu is an infection of the digestive system that causes vomiting, diarrhea, cramping, nausea and upset stomach. The stomach flu develops when an infectious organism enters your digestive system, such as the astrovirus, norovirus or rotavirus, causing inflammation and swelling throughout the gastrointestinal tract. This condition commonly causes severe diarrhea, which could lead to dehydration. According to the Centers for Disease Control, or the CDC, the most effective way to reduce your chances of becoming infected by a stomach virus is frequent hand washing, avoiding foods and beverages that do not appear to be suitable for ingestion and disinfecting hard surfaces that are commonly touched, such as doorknobs and countertops. Staying current on recommended vaccinations can also prevent contracting certain viruses that cause the stomach flu. If you have the stomach flu, avoid public places and being around people. Vitamin C is a common vitamin supplement that is used for its antioxidant properties. Antioxidants help to remove free radicals from the bloodstream. Free radicals are deformed cells that may lead to disease, cancer, heart disease and arthritis, according to MedlinePlus. Vitamin C has been a traditional remedy for treating and preventing colds, but MedlinePlus states that vitamin C does not reduce the risk of someone developing the stomach flu. Before using any dietary supplement, talk with your doctor about the risks and benefits. If you have the stomach flu and you take large doses of vitamin C, you may prolong or worsen your diarrhea. 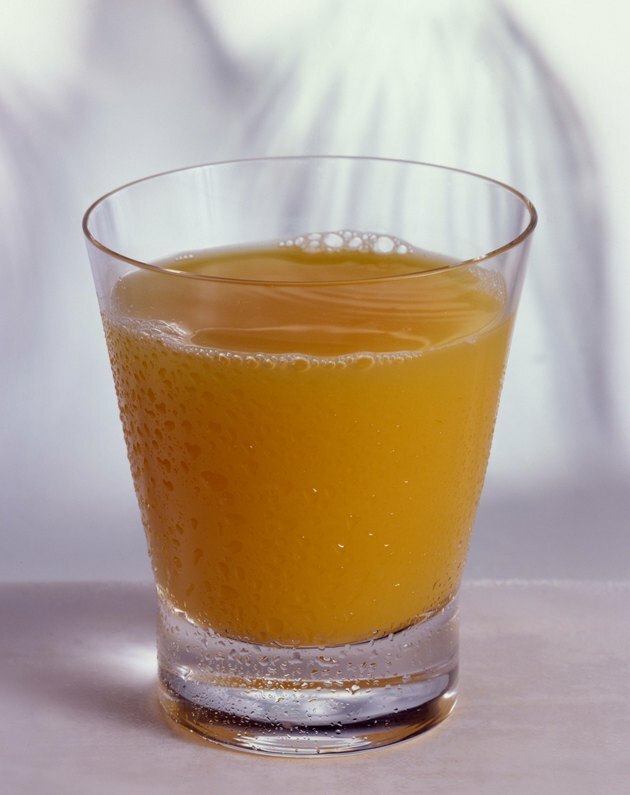 Vitamin C is water soluble, meaning whatever your body doesn't need will be expelled from the body. Loose stools are a common side effect of taking too much vitamin C.
Do Grapes or Grape Juices Help in Preventing Stomach Viruses?